Set high goals so if you miss them, at least you’re closer than if you didn’t try… Yes, I’ve heard that adage too. Setting goals that scare us can be both productive and destructive. So how do you know what to do? Should you adjust goals that scare you or just keep on keepin’ on? 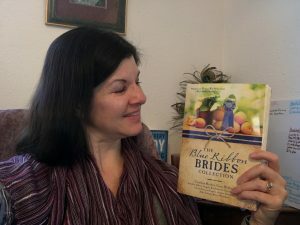 Bringing history to life, Angela Breidenbach holds her new book, Blue Ribbon Brides. Recently I had the opportunity to write on this topic in an article from MTL Magazine because of my new book, Blue Ribbon Brides Collection, that includes 9 novellas from 9 authors. Seven Medals and a Bride is mine. I began the research stymied by the volume of botanical terms. (If you know me, you know I’m not a science major.) But then I was drawn into the research because of small notations about the lengths the women I was researching went to in order to achieve their goals. Quite honestly, it blew my mind! Goals that scare me are both productive and destructive. Why both? Because when I see the process, the patterns, and set my mind to that goal I can break out pieces and manage the smaller pieces. I get really, really productive and most often achieve the goal. But I’ve had a few that were just out of my reach, tips of fingers scratching air instead of grasping the goal. You too? Baby Angela, a few weeks old. It’s been like that for me. Both exhilarating and frustrating. That’s when I decided I needed to go back to college. I needed and wanted to know what didn’t know so I could succeed at my goal of solving certain family mysteries and proving that those solutions were fact, not fiction. 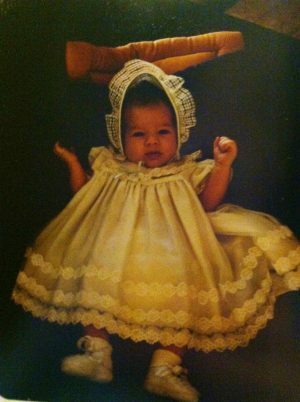 (Like the one my mother used to tell about being related to Pocahontas because I looked like a papoose when I was born, her words, or the one where we were related to Lord Byron Nelson…neither of which have been substantiated. In fact, they are easily disproved now that I know a little more what I’m doing.) But what about those snippets of history that are boring and true like, oh, botanical science display meetings noting dollars and attendance? Bringing history to life is like finding pieces of a jigsaw puzzle, but when you’re done some are missing no matter how hard you’ve searched. That’s where fiction comes in. By fictionalizing those missing pieces, we get the spirit of the experience. A lot of the names and places I used in Seven Medals and a Bride are real. But in order to bring the experience to life I put a fictional romance into the true historical facts and humanized it in a way that names on a page or a list of expenses can’t do. I’d love to talk to these people and find out they’re experience: Mrs. Fitch, Jennie H. Moore, the Reverend Doctor Kelsey, the unnamed women who traveled Montana to gather and preserve our flora, and more. I have a feeling that’s why God made heaven eternal. In addition to talking ourselves out with him, there are so many people I want to talk to that it will take eternity for all those questions and conversations. If you could talk to people who’ve gone before you, who would they be? I’m not asking about the obvious, Jesus, or his disciples. Who in history has fascinated you with their achievements? What would you ask? If you’d like more information on Blue Ribbon Brides, please visit this page to learn about all the stories in the collection. If you’d like to read the article on the incredible achievements of historic and heroic Montana women, please visit MTL Magazine.